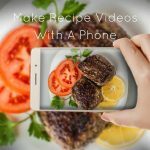 A video tutorial on how to Make Recipe Videos 10 Steps Using Smartphone. * If you have not seen my lighting setup video, then please watch that video first to see how I set up my lights and backdrop: My Lighting Set Up Tutorial . 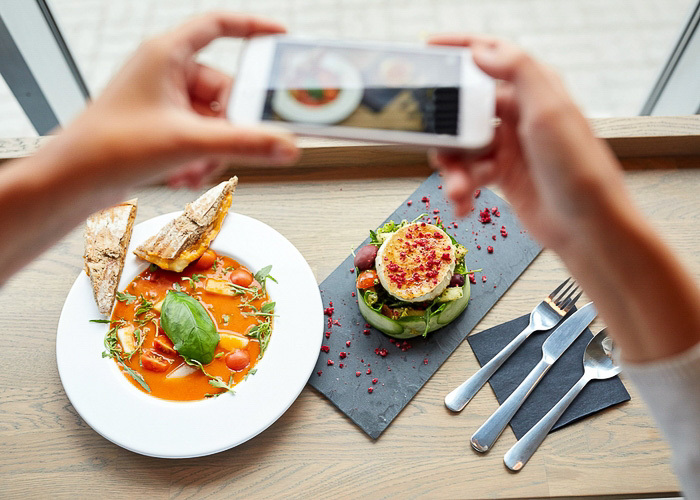 You can make recipes videos 10 steps using smartphone. Make a recipe shot list: Write down a list of all the recipe steps and ingredients for the for the video. Each step is shot separately & the shot should be 15 seconds or less. Fully charge phone & put phone in airplane mode, so not to be disturbed by notifications. Go to the camera settings,( a little gear symbol in the corner) and click on video size, then choose 1920 x 1080 Full HD or 1280 x 720 HD if your camera does not have 1920 x 1080. My phone actually has a 4K size, but that file size takes up too much space, and is more suited for cinematic type films. You can also click on video or image stabilization if you have that option as well. Always shoot in horizontal orientation and not in vertical for high quality. Those square videos are cropped or resized in a video editing software. Always use the back camera, and never the selfie camera. The back camera is a better camera and has more pixels. If you’re familiar with photography and camera settings (for example: shutter speed, ISO, white balance, etc), then use the built in camera app called Camera Pro Mode on Android, or use the paid app for Iphone called Filmic Pro, so you can adjust the settings for exposure. If you are not familiar with these, then go ahead and use Auto for camera settings (so the camera will pick the settings for you). Turn off audio, or you can also detach & remove any audio in a video editor later. If you are appearing in the video and talking, then you will want to use a lavaliere mic (clips on to your shirt) or shotgun mic (plugs into your phone). If you just want to explain the steps with voice, then I recommend doing a separate voice recording with a microphone that plugs into your computer (like this computer mic) and use a free audio recording software like Audacity to record voice and download as an mp3 file. Then add the voice recordings into the video in editing. Set up the 3 point lighting from earlier 1st video. Watch the lighting setup video in my previous video. Don’t film in one long continuous session. Film each recipe step in separate 10 to 15 second shots. This works much better for when editing the video. It is easier to shoot using a camera video remote for your kind phone to avoid camera shake from pressing the filming button on and off. Shoot each recipe step on your shot list. Hi, I just came across this and it’s so helpful. Can I use my phone to make videos when my cooking with my gas because I’m scared to do that.i feel it’s risky. Please I need an urgent answer. Thanks. These videos and tips are so helpful! I’ve been struggling finding good info on making recipe videos using your IPhone so thank you!! Thank you so much Heather. It took me so long to figure it out as I went. When I started making videos a year ago, there was just no information at all to be found. Great video! You explained each step really well. It’s so much less scary to get into video using an iPhone that I’m already comfortable with than spending loads of money on a new camera that will take me a lot of time to figure out. You’ve inspired me to get started. Thank you Annissa. You’re very kind. I started with my phone and still use it sometimes as it is much easier than using my camera. I do use my camera now too, but the set up is more complicated and my one camera requires much tedious manual focusing. I will do a tutorial on that eventually, but it it makes my head hurt just thinking about it.